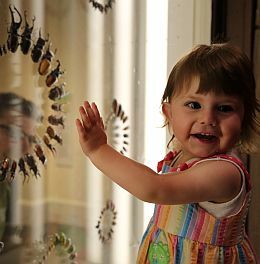 Family learning is at the heart of the museum visit experience and the exhibitions throughout the museum and art gallery have been created to offer inspiration to children and adults alike. In addition to formal education programs for school students, TMAG offers a dedicated program for families, with a particular focus on engaging visitors in early learning programs. A range of hands-on programs and resources, events and exhibits allow families and children to explore the museum and art galleries at their own pace and in a way that best suits their group. TMAG has recently developed a Kids in Museums Manifesto that outlines our commitment to ensuring visitors have a family friendly experience. It can be downloaded here. The manifesto was developed with input from the newly formed TMAG Children’s Reference Panel, as well as advice from the Commissioner for Children, Tasmania, and the Children and Young People’s Advisory Council. The TMAG Children’s Festival returns in 2019 for another week of fun during the April school holidays. The theme for the 2019 festival is “EarthTime”, so come along for a range of free special events, displays, programs and activities suitable for children of all ages. Full program available now. The Tasmanian Museum and Art Gallery is a world of discovery, and our new Sunday Discovery Days are perfect for families of all ages. They take place on a series of Sundays throughout the year, each with a different theme. For details on upcoming Discovery Days, keep an eye on our events page here. TMAG’s ever popular school holiday program returns each school holidays, offering a range of activities across the full spectrum of TMAG’s collection and into the community’s wider interests and environments. Keep an eye on our Events page for upcoming programs. The Young Collectors case has been a popular part of TMAG’s displays for many years. There have been collections about dragons, sheep tags, bones and dominoes, even simply 'green things', amongst many others. People collect all sorts of things for interesting reasons. Do you have a collection that you would like to display and that would be interesting for other people to look at? 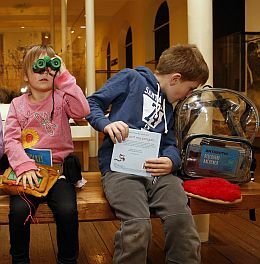 Discovery backpacks are a free, in-gallery loan resource designed to help families explore specific areas of the museum in a fun, engaging and hands-on way. The backpacks are filled with objects, props, activities and resources across a number of subject areas including History, Art, Antarctic and Southern Ocean and Natural Sciences. Each backpack journey can take up to one hour and they are suitable for children aged 7-12 and their families. Backpacks can be collected from the Visitor Information Desk. The Early Learning Program specifically focuses on children up to the age of 5 in recognition of the important role a museum environment can play in early childhood development. The Centre for Learning and Discovery space in the museum provides a bright, lively and playful area for exploration through guided programs. Bookings are essential for all programs. To make a booking, please go to the Families and Early Learning Programs Enquiry Form. A dynamic 1 hour weekly program over 4 weeks, for young children and adults to explore, enjoy and discover the museum together. 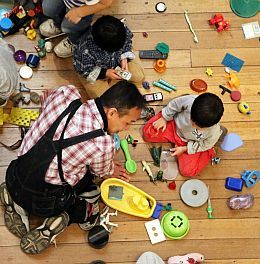 The program encourages children to look closely at collection objects and be guided in exploring and drawing them. Eye Spy is designed for pre-school children aged 3-5. Younger siblings are also welcome to attend. Eye Spy is a free program. Bookings for the Eye Spy program are essential. This is a playful introduction to the wonders of lifelong learning in an environment of curiosity and awe – your museum and art gallery. A five week program will be offered each term to a new group of children aged 1 to 3 years and their carers. Through stories, hands-on experiences with museum objects, active play and exploration, children and their carers will see TMAG as a place of delight. Themes explored across the five weeks will include Curious Caterpillars, Fur and Bones, Moon Birds, Cold as Ice, and Artists at Work. Bookings for Curious Caterpillars Playgroup are essential. Payment is required at the time of booking and is non-refundable. This exciting development in early years programming at TMAG is assisted by funds from the Tasmanian Early Years Foundation. This page was last modified on 20th March 2019.